Past the airport and resorts of Jeju Island, a small village with a population of no more than 2000 sits along the coast. As you walk through Gangjeong Village on a Sunday afternoon, the distinct culture of this town is tangible. You can hear calm music as the owner of the Peace Library and Cafe plays the accordion and greets the children and families passing by. On Tuesday evening, the village held a concert at the Peace Center, where leaders of the Buddhist Temple and Christian and Catholic Churches joined community members and activists for an interfaith concert. 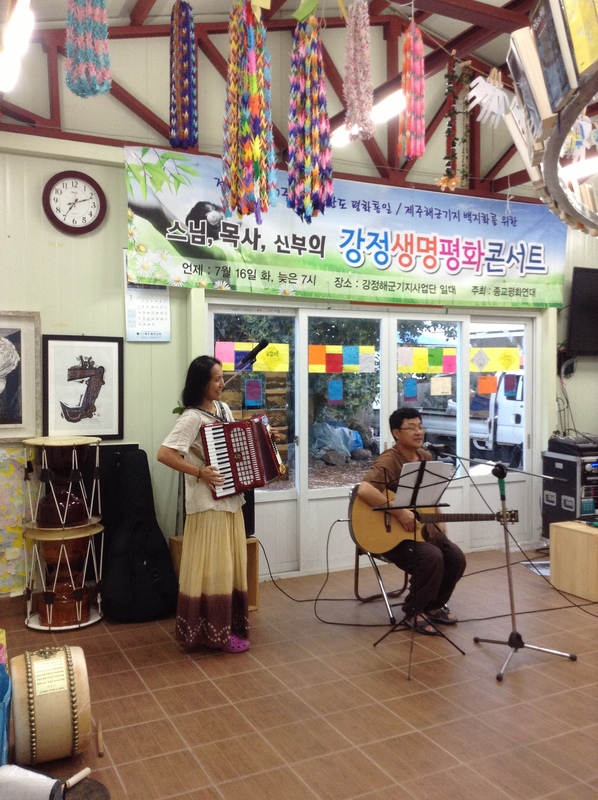 Monks, priests, and village residents sang and played music to promote peace. Anti-base families and volunteers clapped to songs written against the illegal construction of the naval base in Gangjeong Village. The love of music runs deep; everyday, activists sing and dance with pride and dedication in their struggle to save their village from militarization. Even after daily clashes with police, dozens come to join this cheerful end to a long, hot morning in front of both gates of the construction site. Those in passing tour buses look out of their windows in curiosity and residents driving by smile and wave as we dance through the road. Speakers often ring throughout the village from the mayor’s office to announce anti-base events and news. The fresh air of the countryside, the countless greenhouses full of tangerine trees, and farms growing tomatoes, garlic, and white lily, offer residents and visitors alike a serene atmosphere. Few cars travel through the roads as everything in the village is in walking distance – many residents ride bicycles or mopeds. And, in a society where safe neighborhoods is believed to be a lost concept, Gangjeong Village attempts to prove us wrong. On many occasions, I have left my bicycle unlocked and unattended next to open roads, and every time, I wake up to it in the same place, untouched. Coming from a city where bike theft is an organized crime and where people are expected to steal, this village was a bit of a culture shock (the best kind, of course). 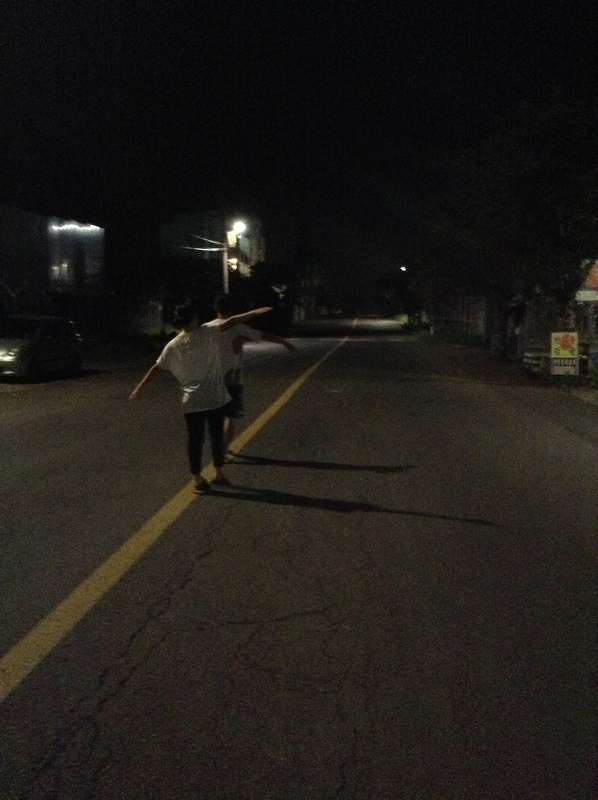 Late in the evening, the air is fresh and the roads are quiet, and you can walk safely in the middle of the main road. Arts & crafts are natural hobbies across the village. Each day, activists carve wood pieces with messages of peace as they occupy the gate of the naval base construction area. Public buildings and gates of home have been painted with images of colorful trees and flowers. Since the controversial base began construction, the streets have been lined with hundreds of banners and messages of love and demands for justice for the village. Gangjeong Village is truly a special place. With Jeju Island’s tragic history of colonization, war, and massacre in the 40’s and 50’s, its proclamation as the Peace Island is held close to the hearts of residents. The naval base construction is truly a betrayal of the people and an ignorance to the devastating past of the island. Though Jeju has recovered over the decades and the construction continues on after seven years, the pain is fresh in the hearts of villagers. Tears fall everyday in the struggle, and activists have no intention to leave this fight behind.